[FRANCE.ILEDEFRANCE 11026] 'Bastille Day in Versailles.' Bastille Day (french: La Fête Nationale), the 14th of July, as it is celebrated in the Gardens of Versailles during the "Déjeuner sur l'Herbe." In English it is known as the Picnic of Versailles, where thousands of people come together with their picnic baskets to have a festive meal on the banks of the famous Grand Canal. The dress code is: all in white. After the meal, of course, you dance, since it is the day of national celebration. Photo Paul Smit. 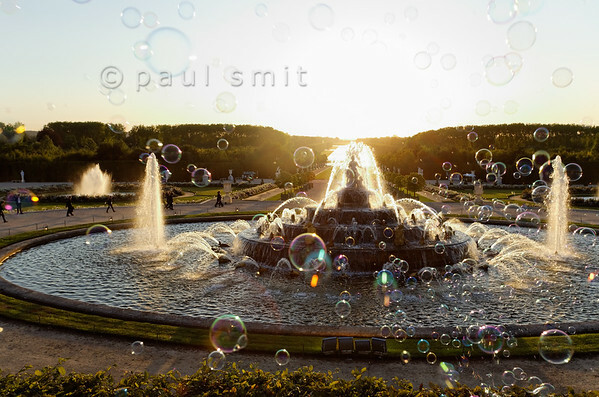 [FRANCE.ILEDEFRANCE 11078] 'Latona fountain, Palace Gardens, Versailles.' Soap bubbles, the Latona Fountain shining in backlight, baroque music and a sunset in line with the Grand Canal - the Fountains Night Show (Grands Eaux Nocturnes) couldn't have a more fairy tale start. Inspired by Ovid’s Metamorphoses, the fountain shows Latona (sculpted by Gaspard and Bathasar Marsy in 1670), mother of Apollo and Diana, protecting her children against the insults of the peasants of Lycia and calling on Jupiter to avenge them. He heard her plea and transformed them into frogs and lizards. The arrangement of the fountain was finished by Jules Hardouin-Mansart in 1689. Photo Paul Smit. 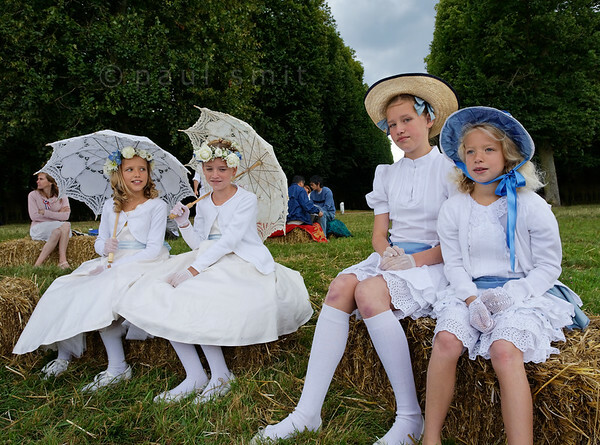 [FRANCE.ILEDEFRANCE 11035] 'Girls at the White Picnic of Versailles.' On Bastille Day, the 14th of July, a wonderful "Déjeuner sur l'Herbe" is organized in the gardens of the Palace of Versailles. Thousands of people come together with their picnic baskets and have a festive meal on the banks of the Grand Canal. 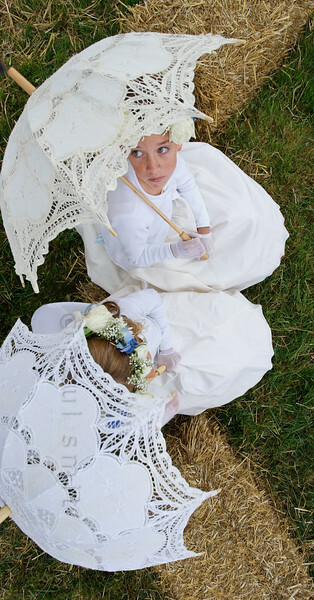 In English it is known as the Picnic of Versailles or the White Picnic ("pique-nique en blanc"), since white is the dress code. Many people enjoy to dress up for the occasion. Photo Paul Smit. [FRANCE.ILEDEFRANCE 11038] 'Children at the White Picnic of Versailles.' On Bastille Day, the 14th of July, a wonderful "Déjeuner sur l'Herbe" is organized in the gardens of the Palace of Versailles. Thousands of people come together with their picnic baskets and have a festive meal on the banks of the Grand Canal. In English it is known as the Picnic of Versailles or the White Picnic ("pique-nique en blanc"), since white is the dress code. Many people enjoy to dress up for the occasion. Photo Paul Smit. 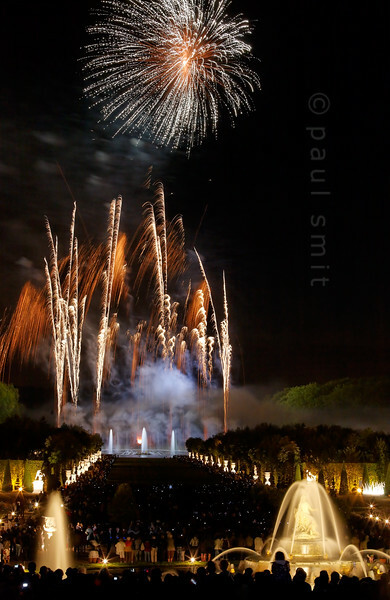 [FRANCE.ILEDEFRANCE 11100] 'Fireworks at the Fountains Night Show, Palace Gardens, Versailles.' The final chord of the Fountains Night Show (Grands Eaux Nocturnes) is a splendid fireworks. The water jets of the Apollo Fountain, in the background, dance with the fountains of light. Photo Paul Smit. [NEPAL.KATHMANDUVALLEY 27456] 'Bisket festival in Bhaktapur's Taumadhi Square.' 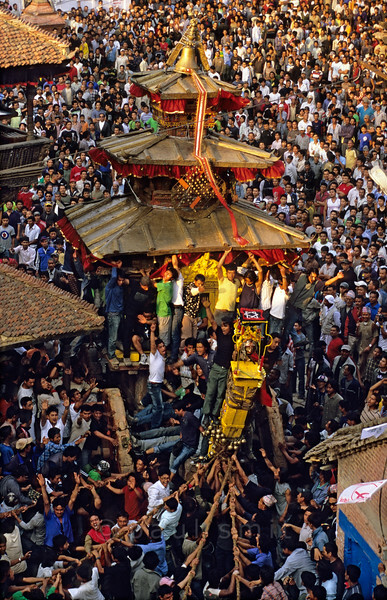 Bhaktapur's New Year's festival (Bisket) starts with a tug-of-war in Taumadhi Square, in which residents of the upper and lower halves of the city try to pull a chariot to their respective sides. The enormous temple shaped rath (vehicle of the gods) contains a mask of the god Bhairava. Photo Paul Smit. [SWITZER.JURA 6323] 'Clique at dusk.' 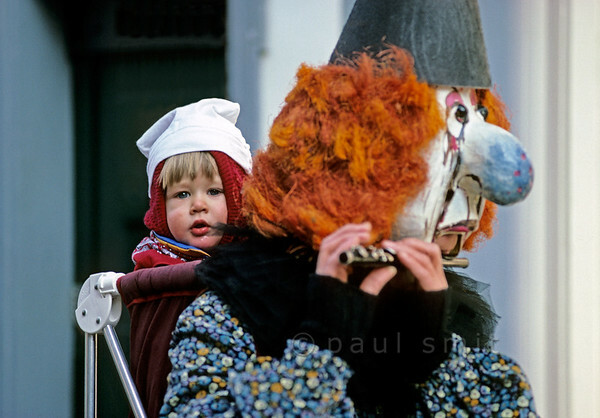 During large parts of the Basler Fasnacht (carnival of Basel) the streets are occupied by Cliques (groups or bands). 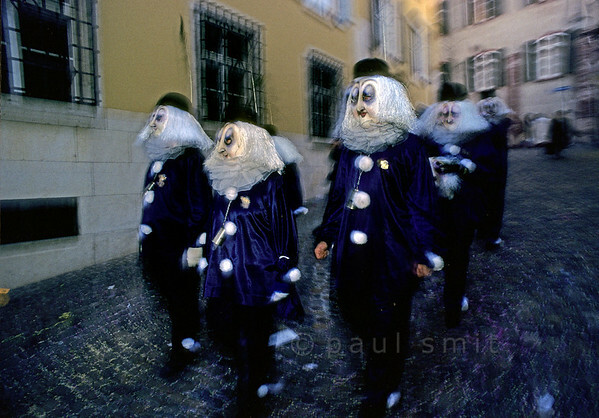 This beautiful ensemble is photographed before sunrise after Morgestraich, the start of the carnival at 4 a.m. on Monday. Photo Paul Smit. [SWITZER.JURA 6358] 'It's great to be with my mom.' 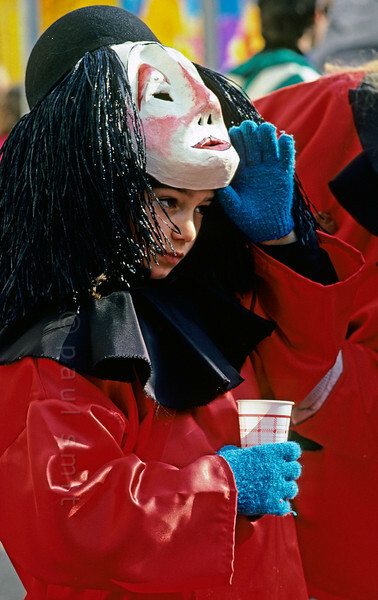 Tuesday is children's carnival during the Basler Fasnacht. Then the children rule and the parents obey. Photo Paul Smit. 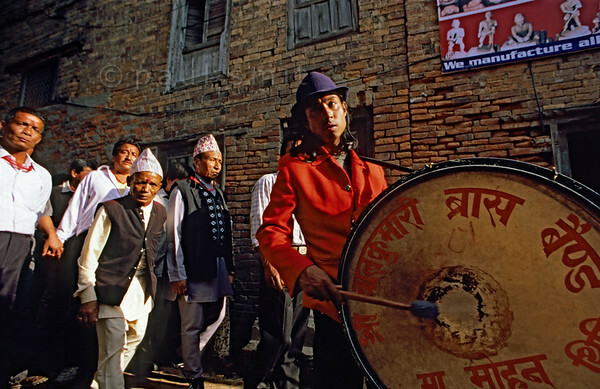 [NEPAL.KATHMANDUVALLEY 27510] 'New Year's procession in Thimi.' On the first day of the Nepalese New Year these men, dressed in their best clothes, are on their way to the Bal Kumari Temple in Thimi. Photo Paul Smit. [FRANCE.ILEDEFRANCE 11051] 'Girls at the White Picnic of Versailles.' On Bastille Day, the 14th of July, a wonderful "Déjeuner sur l'Herbe" is organized in the gardens of the Palace of Versailles. Thousands of people come together with their picnic baskets and have a festive meal on the banks of the Grand Canal. 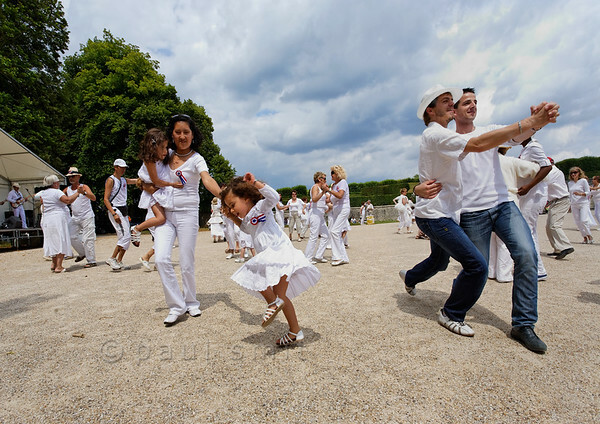 In English it is known as the Picnic of Versailles or the White Picnic ("pique-nique en blanc"), since white is the dress code. 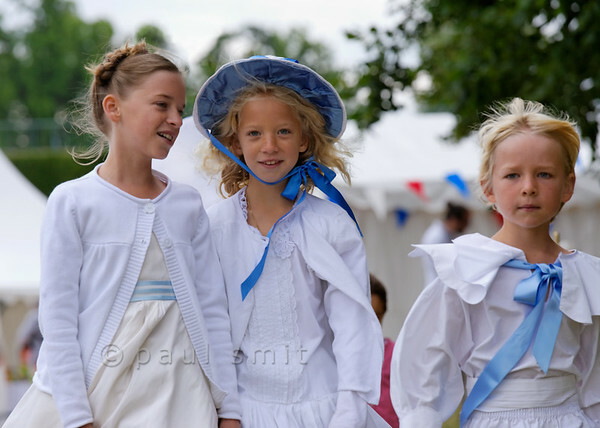 Many people enjoy to dress up for the occasion (costumes by Sophie Morel from Dauphin-Dauphine). Photo Paul Smit.